Invisible in the dark, a light refracting prism catches the tiniest spark of light and brightens the daily good. 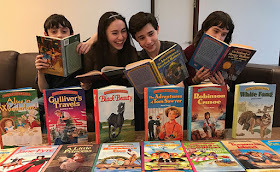 Quite possibly, one of the most joyful websites The Daily Prism has discovered over the years is KidsRead2Kids. "KidsRead2Kids is a web-based platform that provides visitors with read-aloud, abridged versions of literary classics – everything from “The Adventures of Sherlock Holmes” to “Jane Eyre” to “Alice in Wonderland.” And, in line with KidsRead2Kids mission, the readings are performed by a diverse team of young readers," according to Points of Light. From the Kids Read 2 Kids website: Being an avid reader really does make you smarter. But struggling with Dyslexia or other learning disabilities can make reading difficult and not very much fun. So we tend to put the books down and our learning slows along the way. Reading is a major source of knowledge and a great way to reduce stress in our every day lives. Reading allows us to transport our worried minds to another place, so we won’t feel so overwhelmed with the hardships of everyday life. While watching a movie may seem easier or more fun, there is nothing like curling up with a good book. We realize that reading can be intimidating, especially if you don’t have the right resources to help you. Studies show that listening to books is the most important activity to build the skills for reading success. So let us read to you. We have picked our favorite abridged versions of beloved classic stories. Together we can embark on great journeys, travel to foreign lands and meet fascinating people. Along the way you will learn new vocabulary words, boost your analytical thinking, improve your writing skills, and even increase your working memory. Let’s tackle some of the greatest classic literature together – one book at a time.